Pre-heat oven to 180°C/350°F. Chop some cilantro and set aside. Peel and finely chop onion and garlic and set aside, as well. Cut of both ends of the zucchini, then halve them lengthwise and scoop out seeds with a spoon, setting the pulp aside. Transfer halved zucchini onto a baking sheet and season with salt. Bake for approx. 10 min., then remove from oven and set aside. While the zucchini is baking, melt ghee in a frying pan. Add onion and garlic and fry until translucent. Add ground beef and fry for approx. 3 min. until browned. Add zucchini pulp, curry powder, chili powder, and coconut milk. Season with salt and pepper. Fry for approx. 7 – 8 min. until the sauce is creamy, then stir in chopped cilantro. 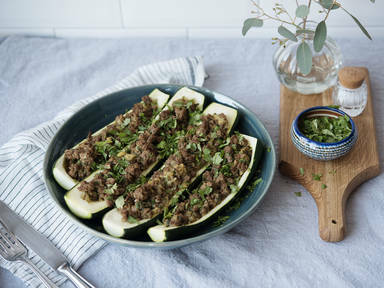 Fill beef-zucchini mixture into the halved zucchini and bake at 180°C/350°F for approx. 10 min. Serve with more fresh cilantro on top. Enjoy!